Farmer John's will again pay tribute to the tender-hearted giants of caninedom. THERE ARE PUMPKINS, as in the round, globular, stem-topped, seed-packed fruits that rule our falltime beverages and porch displays. Then there are pumpkins, as in the super-cuddly, tail-rocking, snout-spectacular sweethearts who share our homes and lives. And while we may never address a pumpkin, as in a gourd, as "pumpkin" — there's no real need to do so, honestly — we frequently call our Fidos "pumpkin" as a term of endearment. (True, we probably have a dozen terms of endearment for our pups, but "pumpkin" has to be way up there for lots of people.) Which is why scheduling a pup-oriented meet-up in a long-running pumpkin patch just works, thematically, so well: You've got a plethora of pumpkinage before your admiring eyes, both of the stemmy assortment and those pumpkins wearing collars. FARMER JOHN'S PUMPKIN PATCH... in Half Moon Bay gets this notion completely, and while an official opening date for the patch isn't quite live — it's still "mid-September" — there is absolutely a date for the 2018 Bernese Mountain Dog Day at the pretty locale. It trots on Sunday, Oct. 7, and lots and lots of Berners and their humans'll make the patch-fun scene. In fact, over 130 Bernese Mountain Dogs showed in 2017, says the site for Farmer John's, and if you can't quite wrap your mind around all of that cuteness, best get your Bern bud into the car on the first weekend of October for this Sunday celebration. "Farmer John will be ready for hay rides for all the pack!," is the enthusiastic word. And might you select a gourd to buy and take home while there? 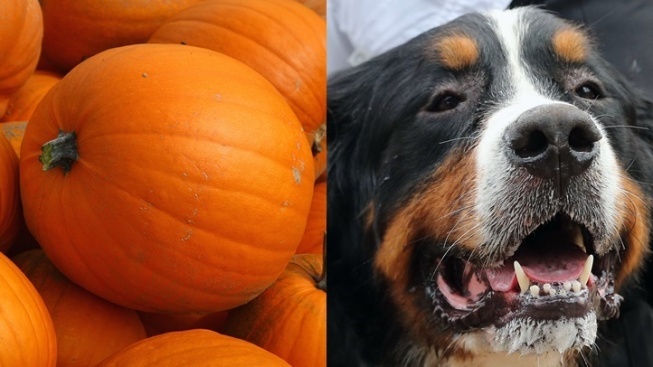 Best let your pumpkin, as in your Bernese Mountain Dog, pick out your pumpkin, as in the orange round carve-ready icon. MORE INFO? Galloop, which is like gallop, but for a pup who likes to lope, over to the Farmer John's site now.